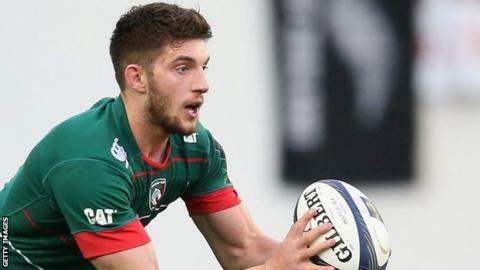 Leicester fly-half Owen Williams hopes he will be included in the Wales squad for the Six Nations, which will be announced on Tuesday. Players based outside Wales may be overlooked in favour of home-based talent with coach Warren Gatland tightening selection policy. Uncapped Williams, 22, came off the bench in Leicester's 40-23 Champions Cup win over Scarlets on Friday. "Hopefully if I play well enough, I'll get picked," he said. Wales begin their Six Nations campaign at home to England on Friday, 6 February, before ending the tournament away to Italy on Saturday, 21 March. Ospreys' Dan Biggar ended the November Tests as Gatland's first-choice fly-half as he helped Wales to a historic 12-6 victory against South Africa. Cardiff Blues' New Zealand-born fly-half Gareth Anscombe, who qualifies for Wales through his mother, and Rhys Patchell may also be in contention, while Scarlets' Rhys Priestland will hope to add to his 32 international caps. Williams was a member of Wales' Under-20 squad that finished third in the 2012 IRB Junior World Championships in South Africa.He had been tipped to win his first senior cap last June on the tour to South Africa, but a suspension prevented his inclusion in the squad. The Welsh management want international players to be based in Wales, following a £60m deal between the Welsh Rugby Union and the four Welsh regions. Williams, who has scored 332 points in 42 games since moving from Scarlets last season, recently signed a new Tigers contract, despite being linked with a return to the Welsh region. "I've made an informed decision and took time to think about it," he said. "I like the club, I enjoy coming in every day and I want to play for Leicester for the next couple of years. I'm pleased to have re-signed." Last season, Williams was regularly selected by the Tigers ahead of England fly-half Toby Flood, who has since left for France. The Neath-born back has made 18 appearances this season, despite the arrival of another England number 10, Freddie Burns, from Gloucester. Commenting on Tigers' bonus-point victory against Scarlets, Williams said: "We started really well and managed the game. "[Scarlets] are a quality team, they've got some really good players. [They had] one or two injuries but they've still got quality to back it up. "We had a poor patch before half-time, but we dug deep and got the four tries [we needed]." Leicester must now secure a bonus-point win at Ulster next weekend and hope other results go their way if they are to make the last eight.